This. Was. Delicious!!!!!!!!!!!! Such a simple, clean, easy recipe that’s guaranteed to rock people’s socks off! My socks are literally still not on because this was so good. I discovered kale sprouts at Trader Joe’s and was so intrigued, I had to get them. They are a hybrid between kale and brussels sprouts. They cook WAY faster than brussels, and I actually like them as much and probably even better! You have to keep an eye on them because they will overcook, but giving them a little crisp will really give them an extra yummy taste. For a little extra awesomeness, fry up an egg and top them off! 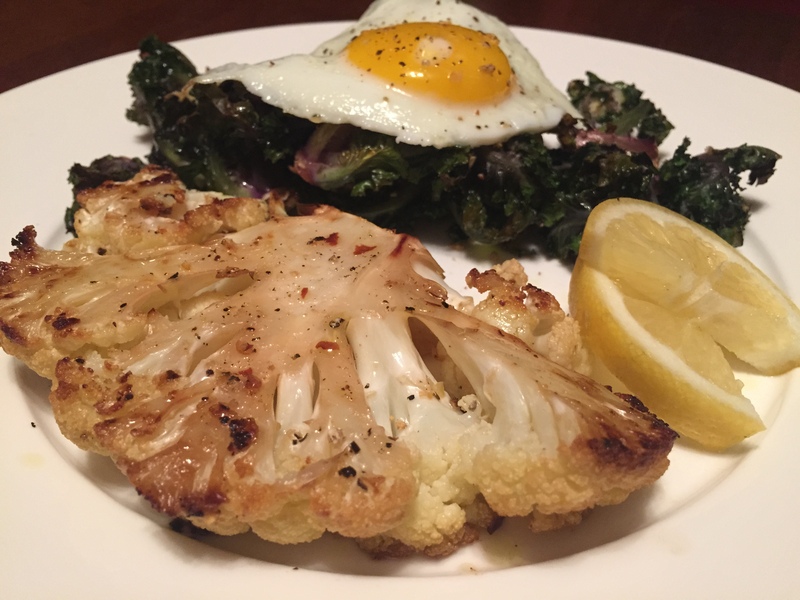 The cauliflower was a whole new level, and so very simple. I found this recipe on Allrecipes, and really wouldn’t change a thing. Now, go make this and astound whoever you cook it for with how amazing cauliflower can be! Cook according to the bag… All I do is roast with olive oil and lemon pepper and boom – it’s done!! Top with a fried egg or eat as is.